In honor of Cinco de Mayo! Preheat the oven to 400. Press the tofu. Slice tortillas into strips and bake for 15 to 20 minutes until crispy. Chop the cilantro and set aside. Dice the onion and saute in oil with salt and pepper. Dice the zucchini and carrots and add into onions. Add chili powder, cumin and turmeric. Stir. Add tomato sauce and cook together. Crumble the tofu and add into the mixture. Bring up to temperature. Add the lime and cilantro and cook for another minute or two. Dice up the avocado. 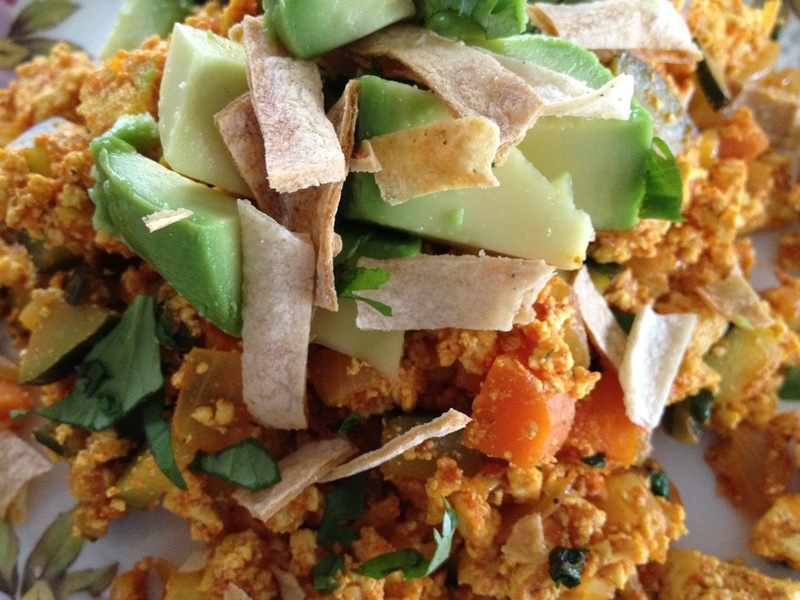 Top a heaping plate full of tofu scramble with avocado, tortillas, and a touch of cilantro. Enjoy!